A hilarious new collection of razor-sharp observations from the New York Times bestselling author of Brain Droppings. Few comics make the transition from stage to page as smoothly or successfully as George Carlin. Brain Droppings spent a total of 40 weeks on the New York Times bestseller list, and this new one is certain to tickle even more ribs (and rattle a few more cages) with its characteristically ironic take on life's annoying universal truths. How can it be a spy satellite if they announce on TV that it's a spy satellite? Why do they bother saying "raw sewage"? Do some people cook that stuff? In the expression "topsy-turvy," what exactly is meant by "turvy"? Guys don't seem to be called "Lefty" anymore. Most people don't know what they're doing, and a lot of them are really good at it. KIDS--They're not all cute. In fact, if you look at them closely, some of them are rather unpleasant looking. And a lot of them don't smell too good either. DEATH ROW--If you're condemned to die they have to give you one last meal of your own request. What is that all about? A group of people plan to kill you, so they want you to eat something you like? Add to the mix "The Ten Most Embarrassing Songs of All Time," "The 20th Century Hostility Scoreboard," and "People I Can Do Without," and you have an irresistibly insouciant assortment of musings, questions, assertions, and assumptions guaranteed to please the millions of fans waiting for the next Carlin collection--and the millions more waiting to discover this comic genius. 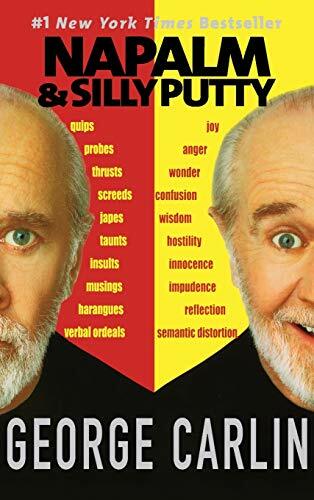 George Carlin, author of three bestsellers, has released twenty-three comedy albums; appeared in sixteen feature films; written and performed fourteen HBO specials; received four Grammy Awards; and been nominated for five Emmy Awards. He was the recipient of the American Comedy Awards Lifetime Achievement Award and was recently named the recipient of the Mark Twain Prize for American Humor.